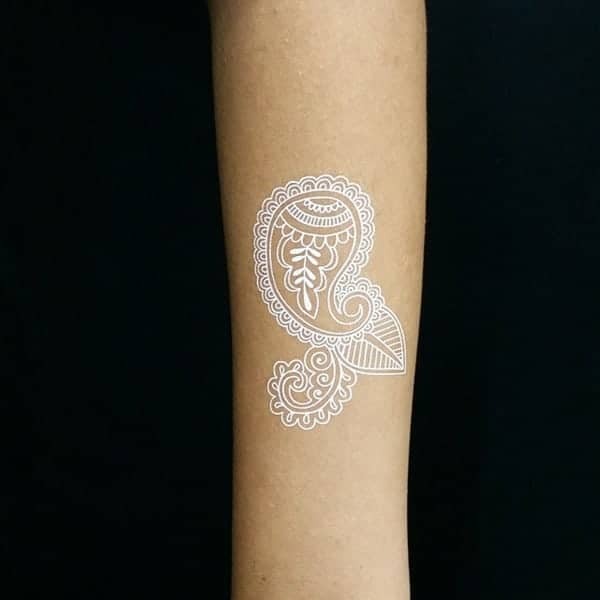 If you are looking for a tattoo that is not only unique but inspiring, then you are sure to love the white ink designs. 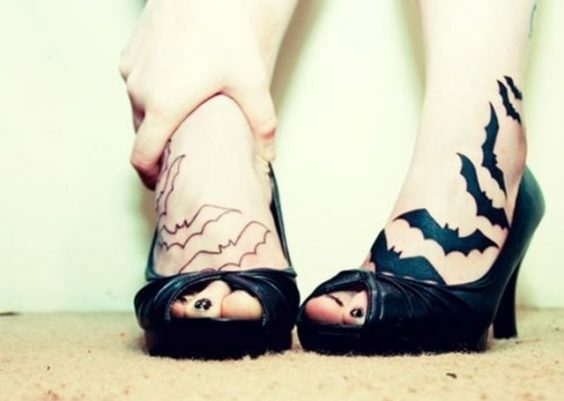 These are the kinds of tattoos that really stand out and make people take notice. 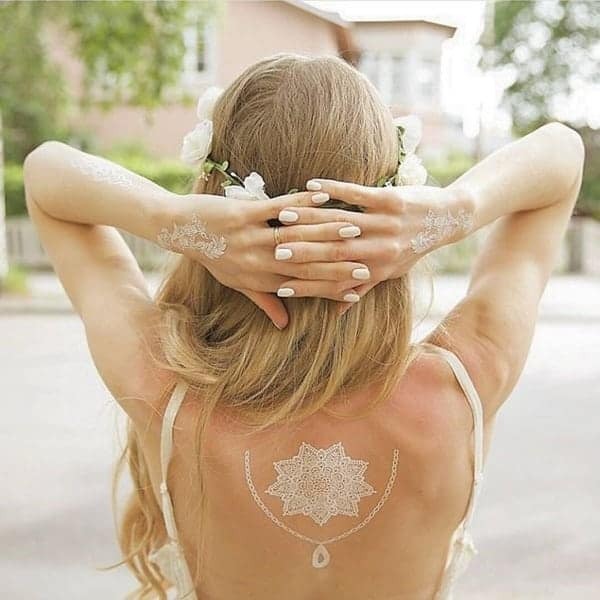 Not only are these tattoos really pretty but they practically glow on the skin. You won’t find a more interesting design than these ones. Who says you need that dark ink? 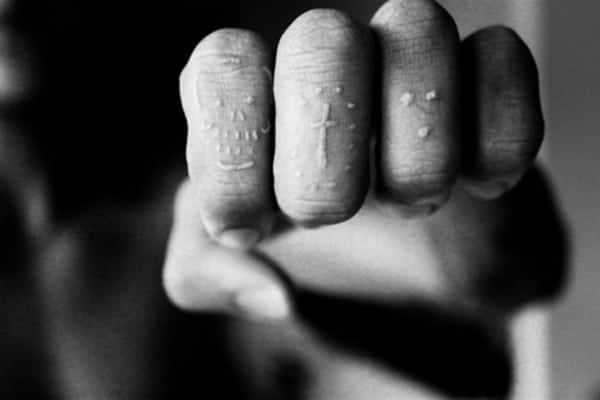 These tattoos are totally different, something most people have never even seen before. There are so many different design options if you are interested in the white ink. Black ink has always been the traditional way to go, but maybe now you want something that is a little more original. Black ink is definitely the most popular ink, but that doesn’t mean that it’s right for you. These days, there are more people interested in the white ink styles though. 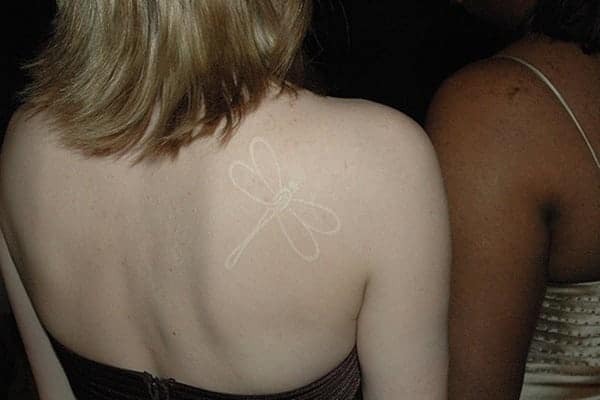 White ink tattoos are popular for both men and women. We have a list of some of the best tattoo ideas out there for white ink and we know that you will love them. Find a style for yourself and then get a talented tattoo artist to make your dream a reality. 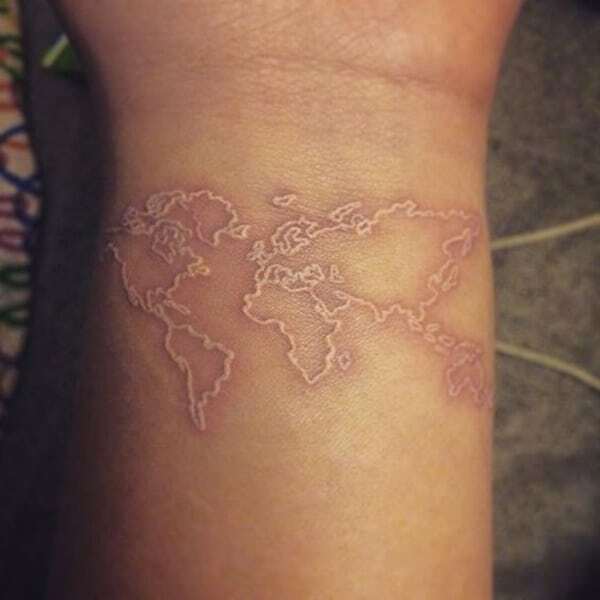 Maybe if you have a love of the world or just want to document your travels, either way, this is a great tattoo idea for white ink. A great design that is not only unique but very creative. If you want something unusual, then you are sure to love this design. 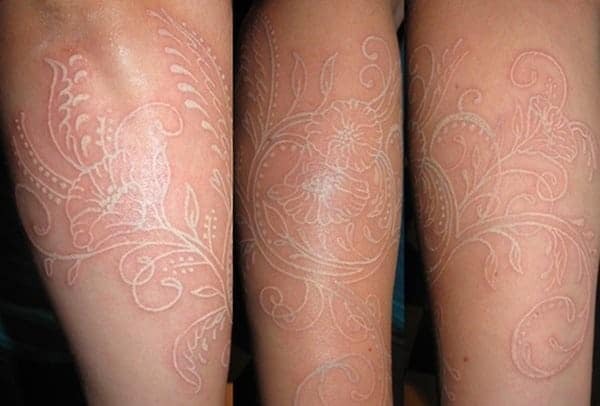 This is very much like a Henna design tattoo but with striking white ink. It’s like having jewelry without the bulkiness of it. You don’t get a more stunning design than this. An interesting design choice because there is no color. 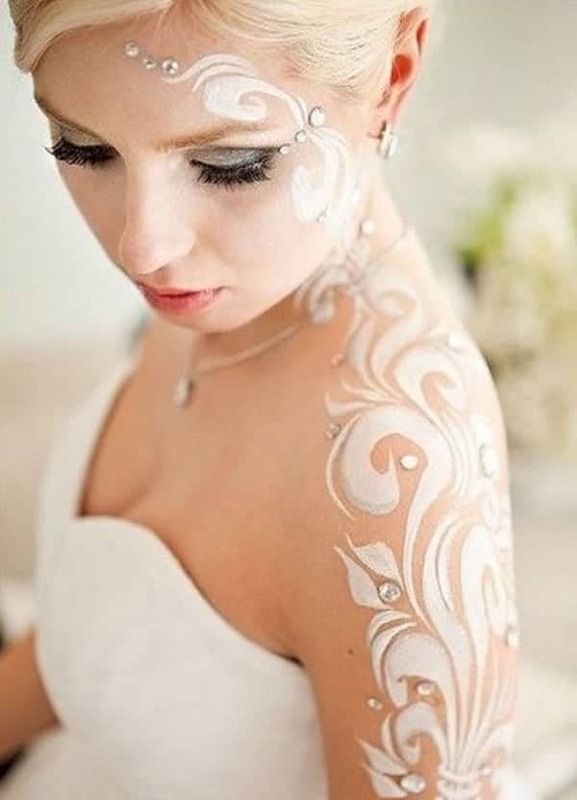 But the white ink really makes for an amazing style. How beautiful is this tattoo design? It covers the entire back, and it is striking indeed. The fact that she has a dark tan just makes the tattoo pop off the skin even more. She also has arm tattoos and together she basically has a work of art on her back. 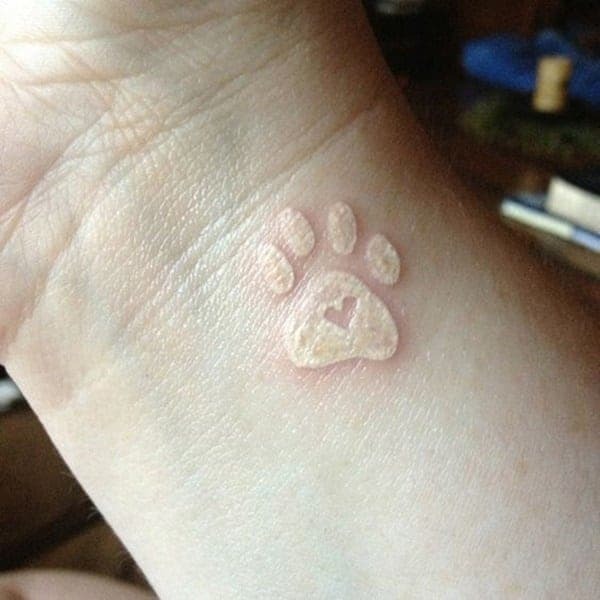 A sweet tattoo design that will represent the love that you have for your pet. An amazing tattoo design for people who love the ocean or possibly even surfing. You can practically feel the surf spraying from this tattoo. 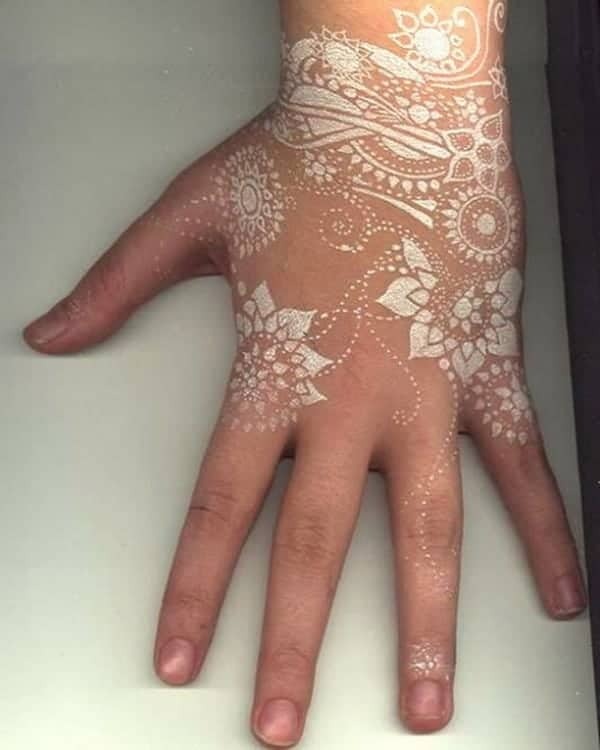 The white ink is just striking with this tattoo. This white ink tattoo has a bit of color to it as well. 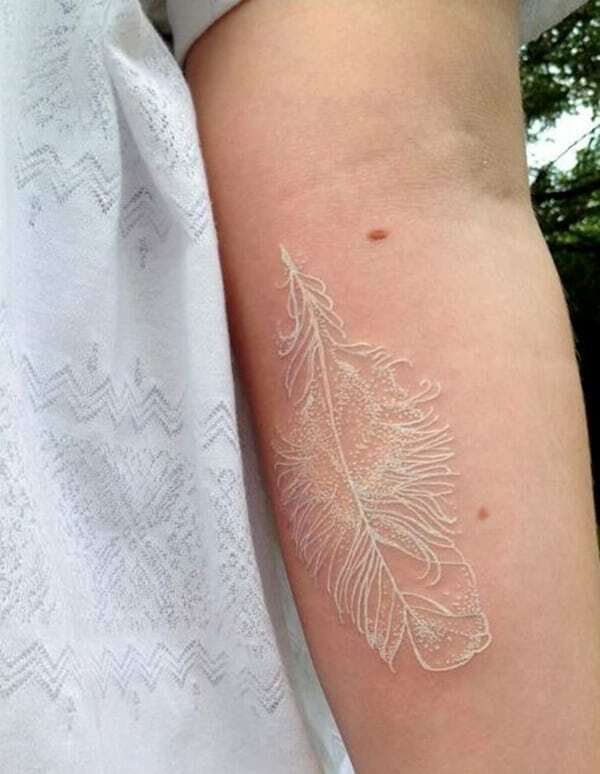 The feather just pops right off the skin in this amazing white ink design. Who didn’t love playing with paper airplanes when they were kids? It’s a great tattoo design for those that want something fun and creative for their tattoo design. It’s a small design that is sure to make you very happy. 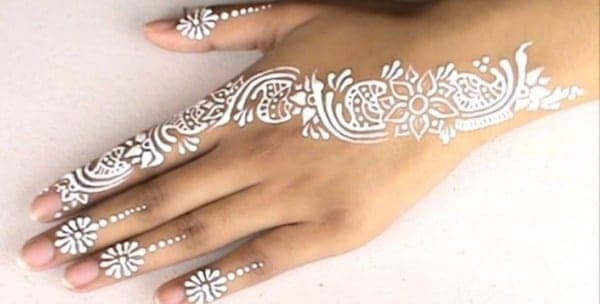 Another Henna inspired tattoo design that bold in the white design. A finger design looks truly elegant and would make a great design for any event. A great and ornate tattoo design that speaks of the joy of wildlife. It’s a creative design that you are sure to love. This is a unique design that is truly beautiful. 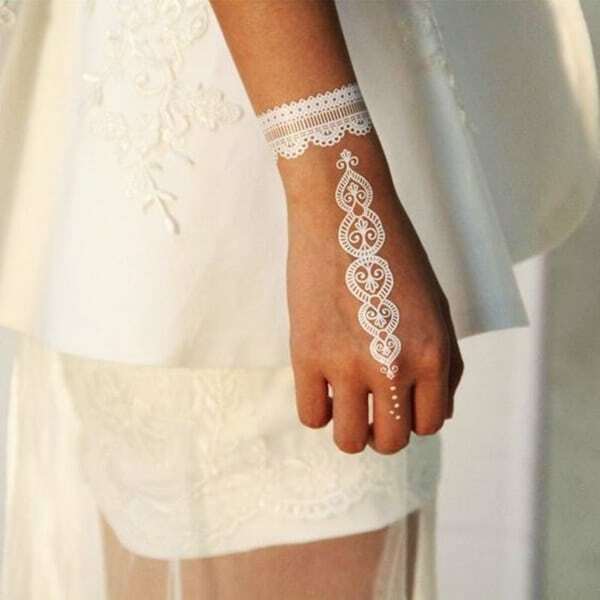 It’s a white ink tattoo that is insanely beautiful and can be kept private if that’s what you choose. These snake tattoos are intermingled together creating a unique design. 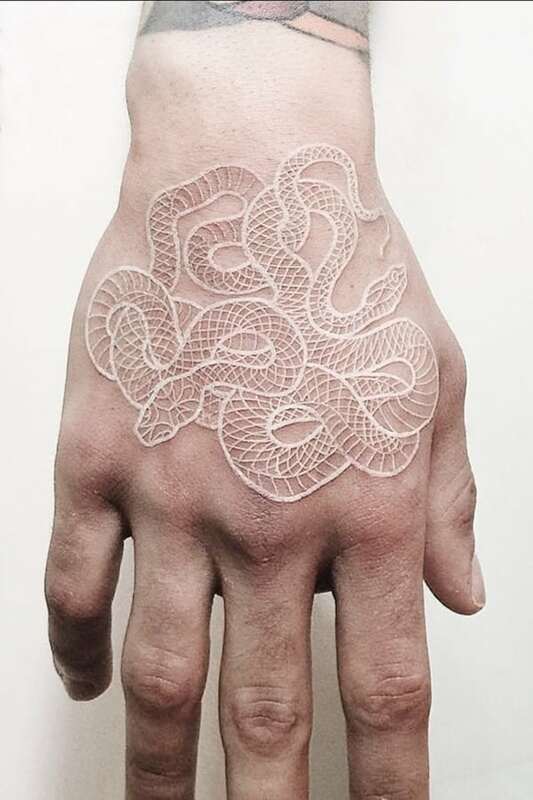 It’s a perfect hand tattoo that really looks badass. 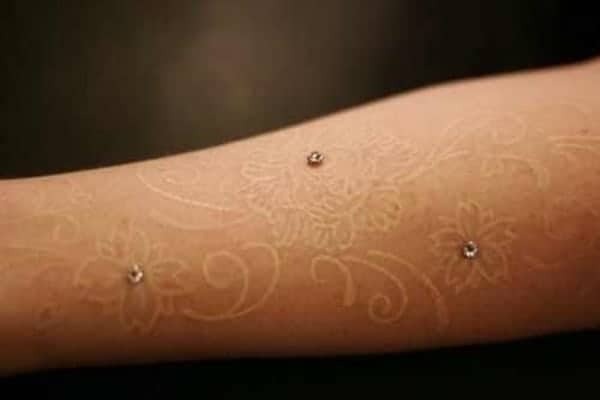 These tattoos are growing in popularity and they look amazing in white ink. It’s a great design for the wrist because it’s a perfect size. A great design that goes down the back. 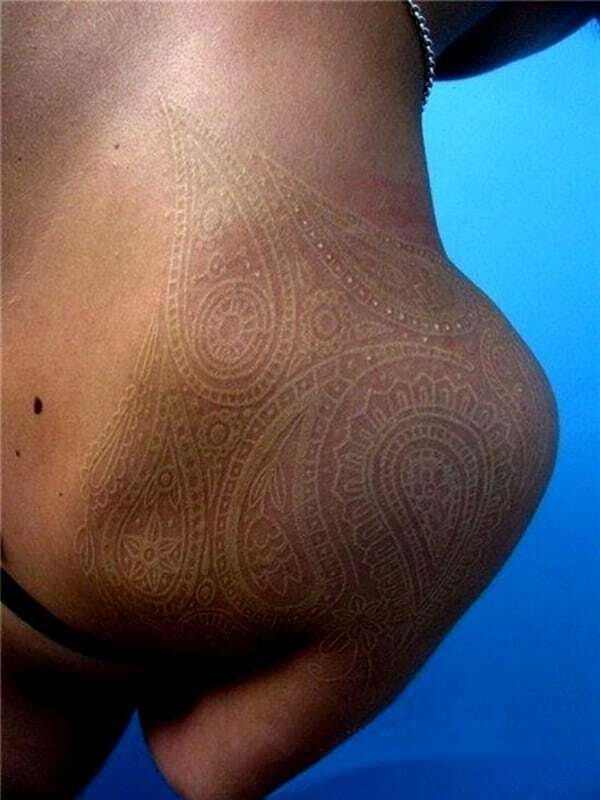 This one looks incredible because of the white ink and her tanned skin. 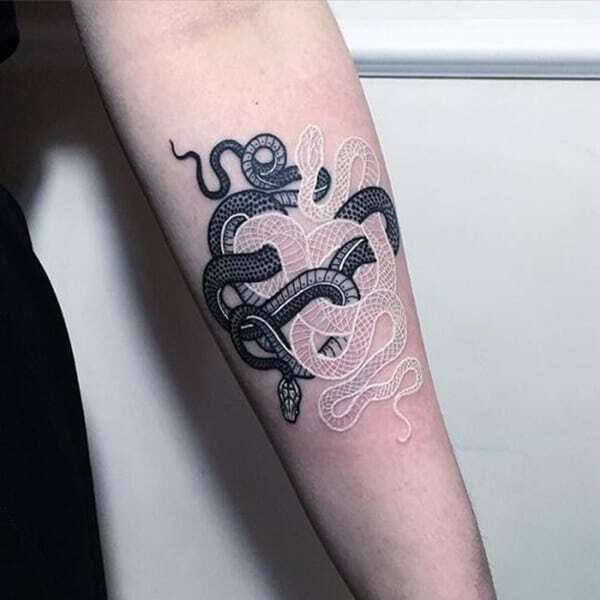 A stunning design that combines black ink with white to create this unique snake design that has both a dark side and a light tone as well. 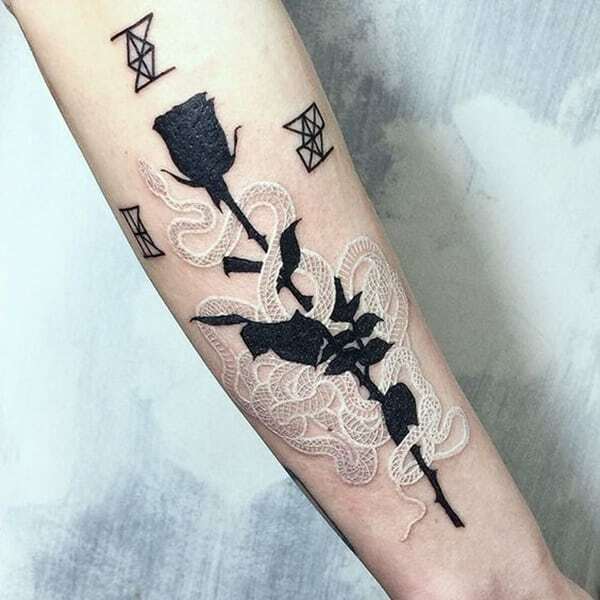 A great design that has a black rose in black ink and a white snake encircling the rose. It’s quite a large snake that is circling the rose; it’s a badass design that is sure to make anyone happy. If you like the black ink then why not combine the two? 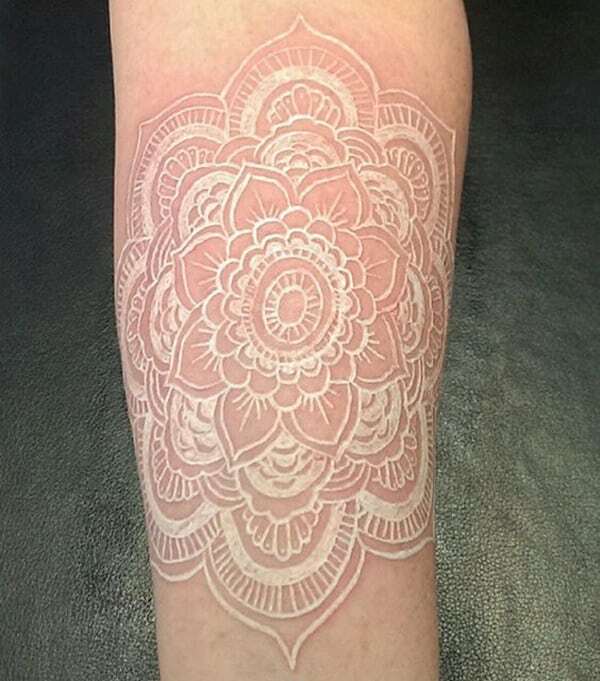 This is a striking design that has black and white ink together. It really makes the white ink look as if it glows. A great anchor tattoo that is small enough to fit on the finger. A great design that can be subtle if that’s what you want. 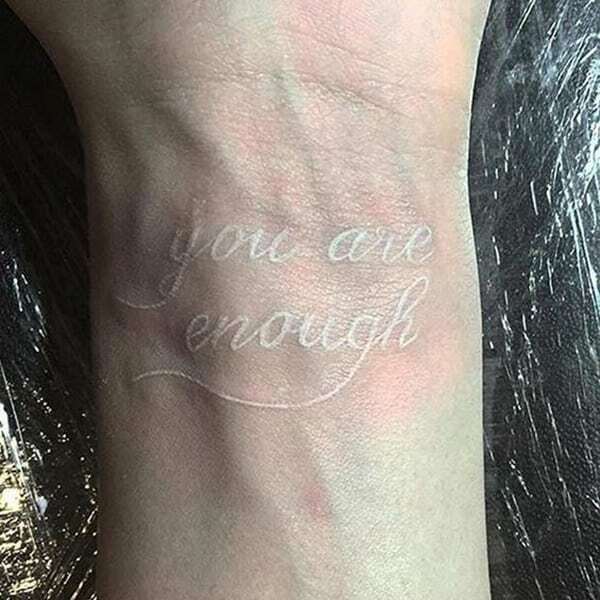 A great quote that is subtle on the wrist, just a simple quote written in white ink. 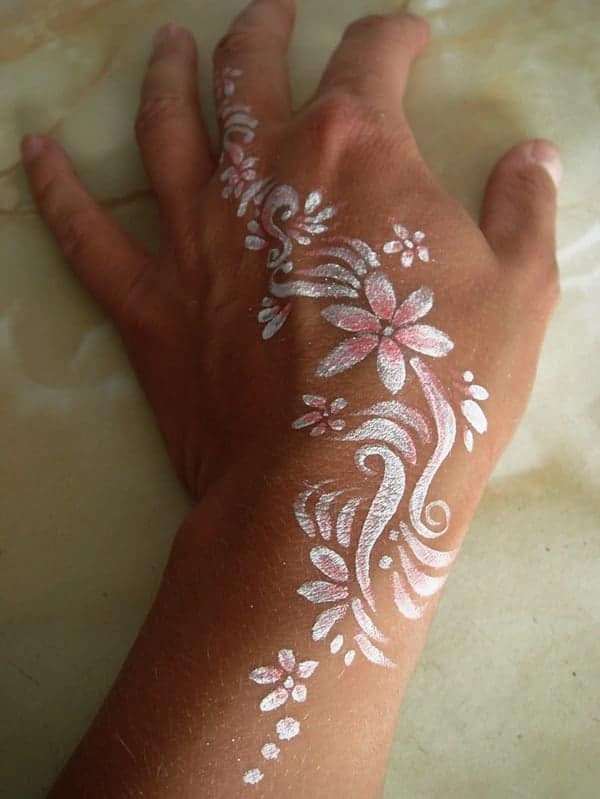 A great floral design that is practically glowing on the skin. 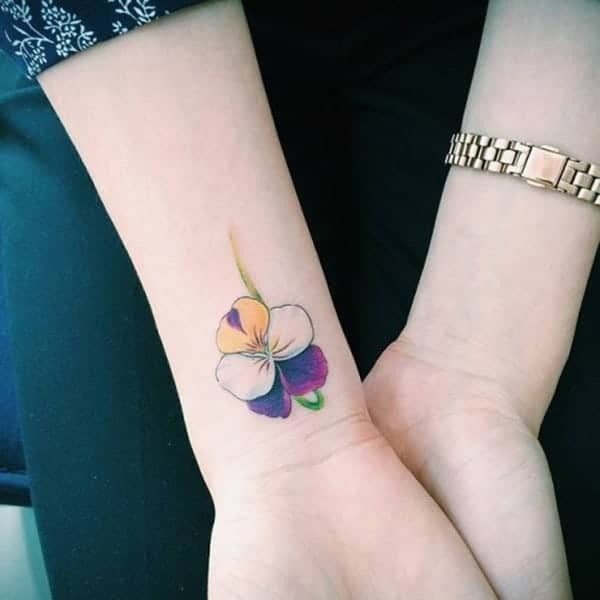 The flower itself is very ornate and it looks wonderful as a tattoo design. 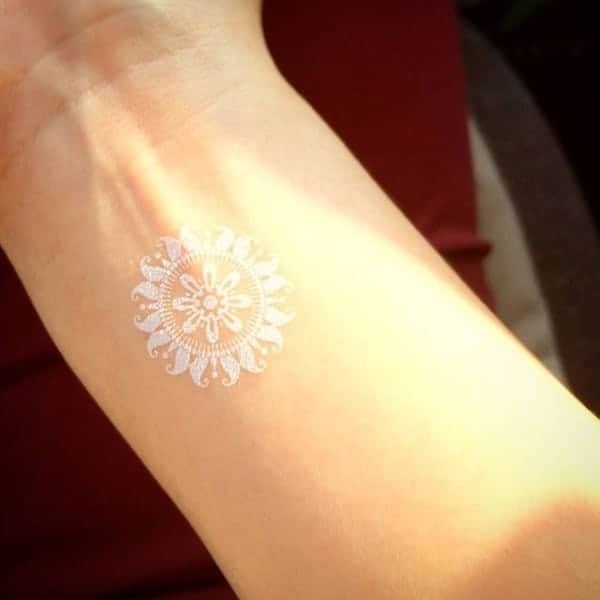 If there is something you need to be reminded of, a personal message that makes you feel better about your life then use white ink to get the message across. It’s a great tattoo with some black ink added for contrast. A great design that covers the entire shoulder. 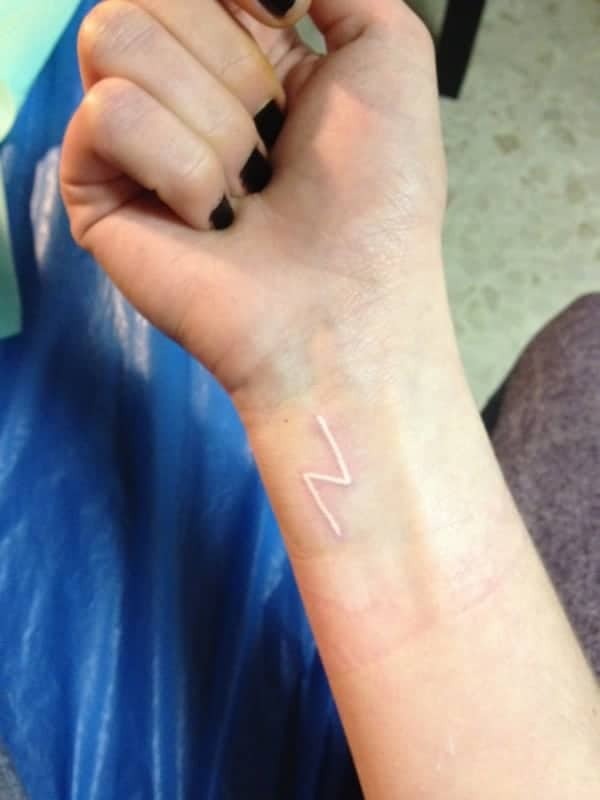 This tattoo isn’t created in a bright white ink. It’s a subtle color that almost blends into the skin so that it’s a very subtle design. A great design that is sure to make anyone happy. It goes the length of the arm and is very pleasing to the eye. A gorgeous tattoo design that sits in the center of the back. It’s an amazing design that you are sure to love. If you have a love for the Irish or just clovers in general, then you are sure to love this design. 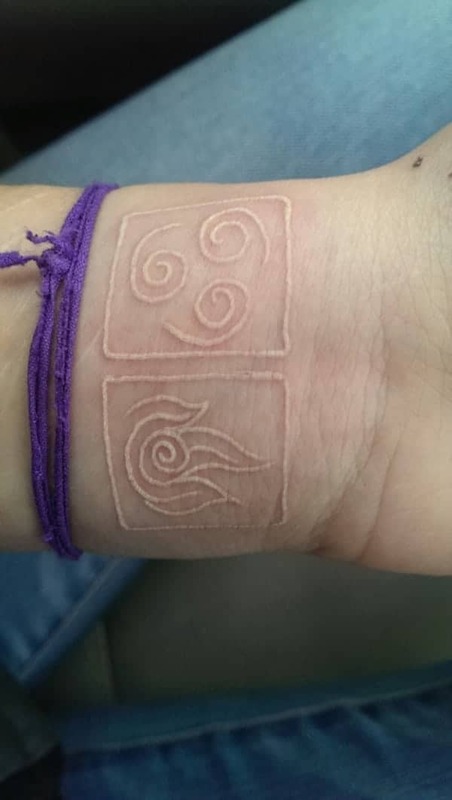 It’s simple yet sweet, a truly creative tattoo. A great tattoo that is unique in its design. 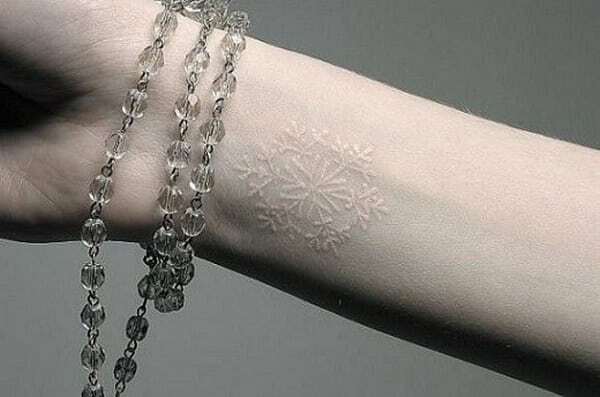 A beautiful feature that looks amazing with the white ink. These tattoos are great because they travel the length of the arm and they have some great detail to them. It’s elegant especially as it gets closer to the finger. 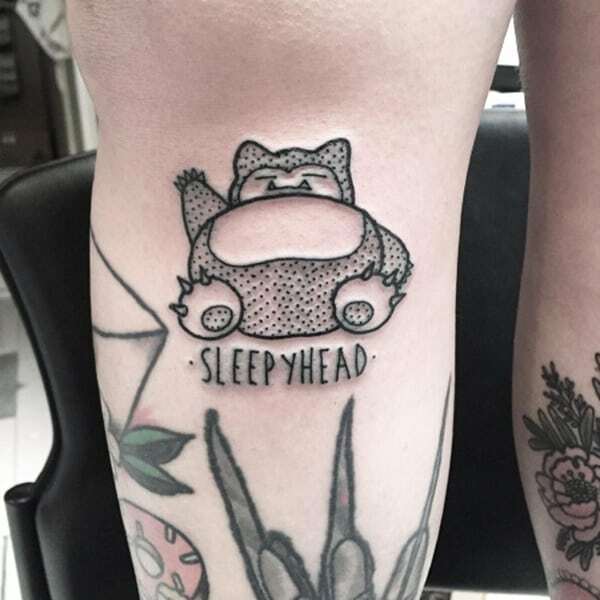 A great tattoo design that is cute and stunning. The white octopus really glows off the skin. A great design for the back and it goes great with her tanned skin. I love these white birds they seem magical against the skin. 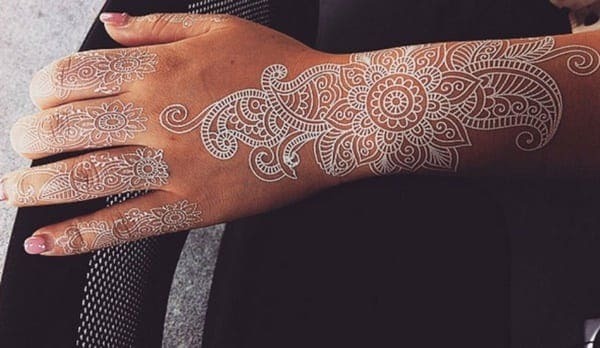 This gorgeous design takes up the whole hand and it really resembles lace. 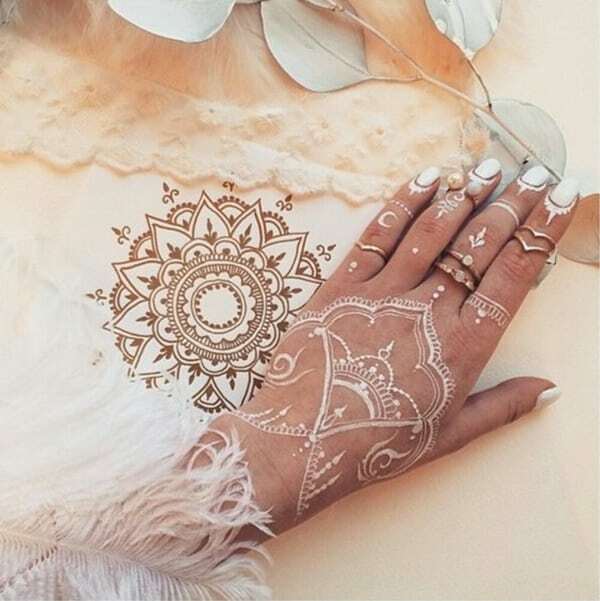 If you want a gorgeous hand design that supersedes any type of accessory that you can get. A great wrist design that has a true uniqueness. It’s so light that it looks like it’s just embossed in the skin. You are sure to love this design no matter what. These designs always look cool because they are perfectly placed. Surrounding the triangular design is a rather large snake done in white ink. It creates an amazing overall design. 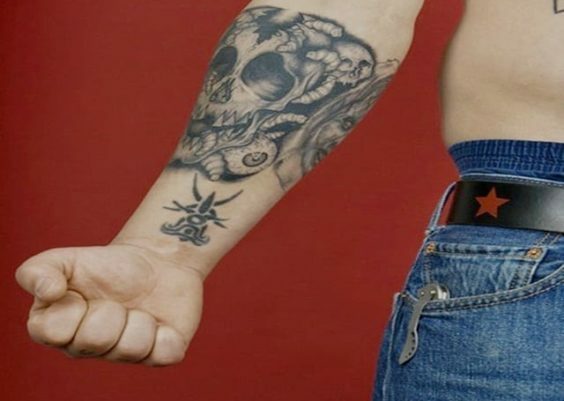 A great tattoo that fit’s perfectly in this area. It’s white ink and it’s elegant as a tattoo. I love the chandelier look of the whole thing. This tattoo is in the centre of her back and it really creates a wonderful design. If you are looking for class and elegance, then this is a great choice. These sleeve designs are always cool and this one has a lot of detail to it. It’s a very intricate design that is sure to catch anyone’s eye. 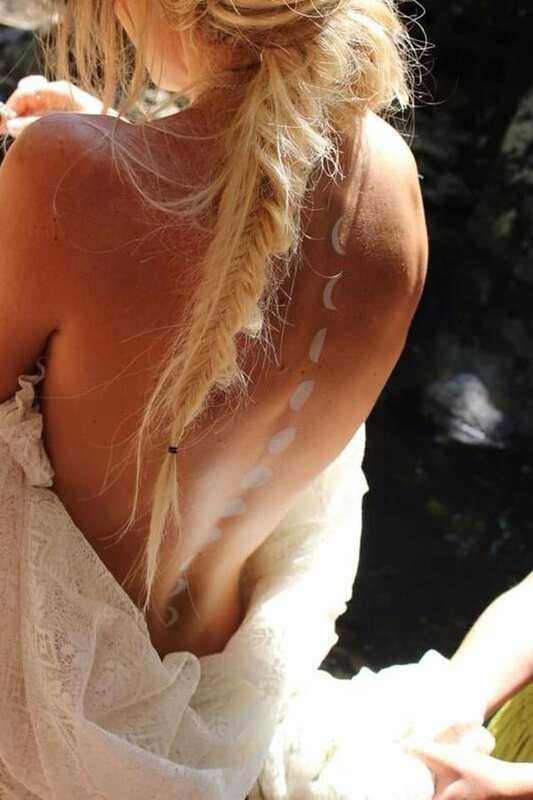 This solstice sun tattoo is really beautiful and it sits perfectly in the middle of her back. 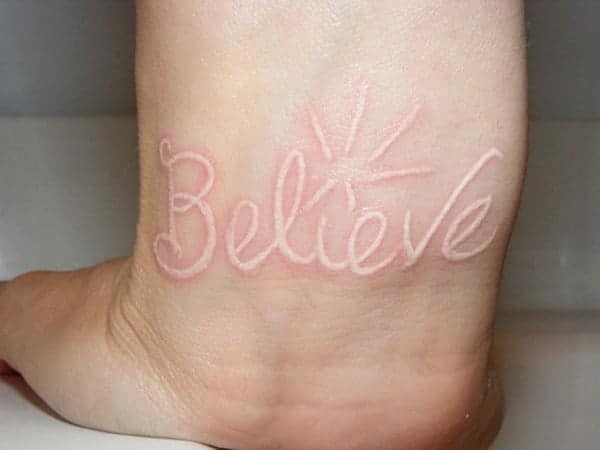 A great tattoo design that is created with a more subtle white ink. If you love these original designs, then you are sure to love this one. 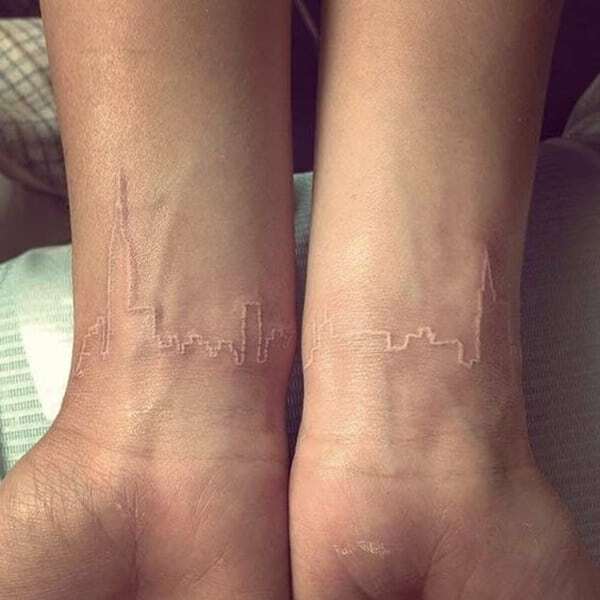 These cityscapes go from one wrist to the other creating a truly unique tattoo. I love the elegant design and it’s the perfect kind that looks good with the white ink. If you love nautical designs, then this would be the perfect tattoo for you. 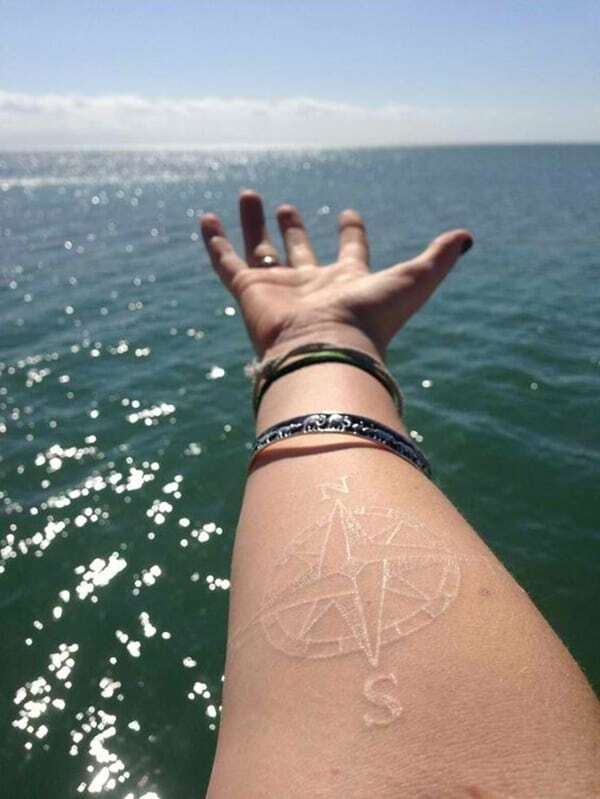 Love being at sea, we don’t blame you and this is a great tattoo design that’s also subtle because of the light ink. Many people are choosing tattoos to solidify their love instead of a wedding band. 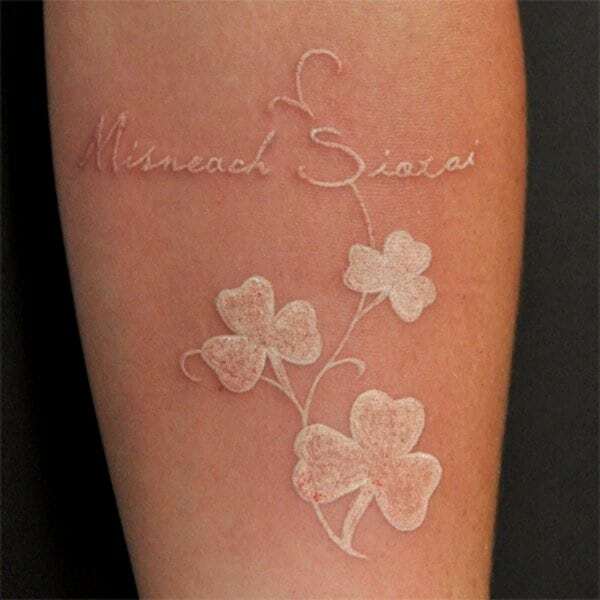 This is a cute idea and it’s done it white ink, so it’s not over the top or too dark. 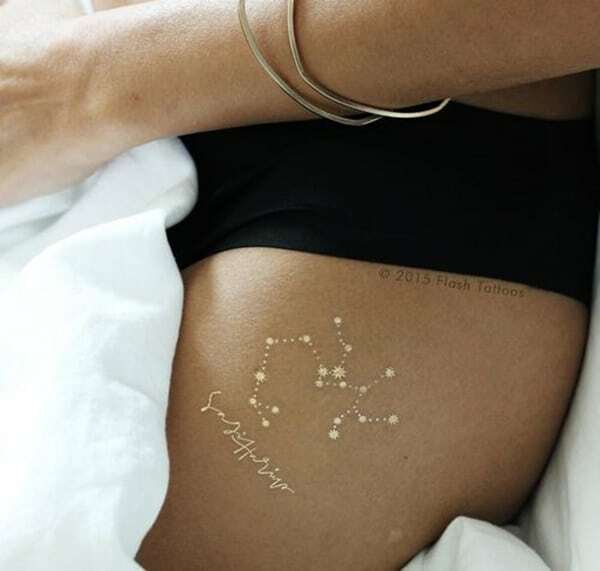 If you are a fan of astrology or astronomy, then you are sure to love this design. It’s a creative way to truly represent the things that you love in life. 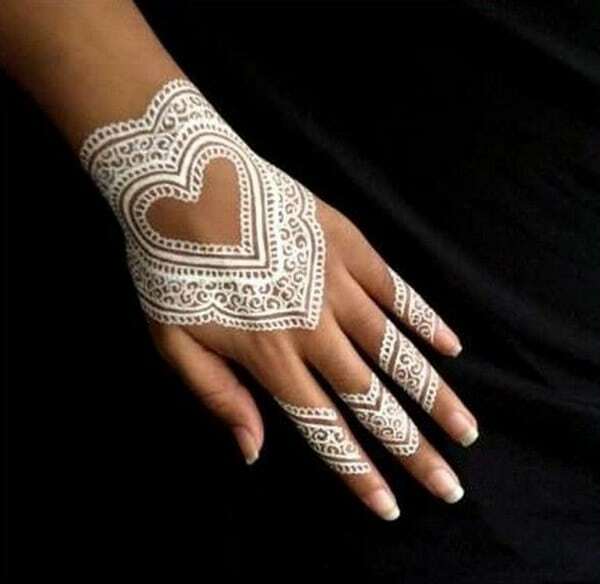 Another example of a Henna inspired piece of art for the hands. 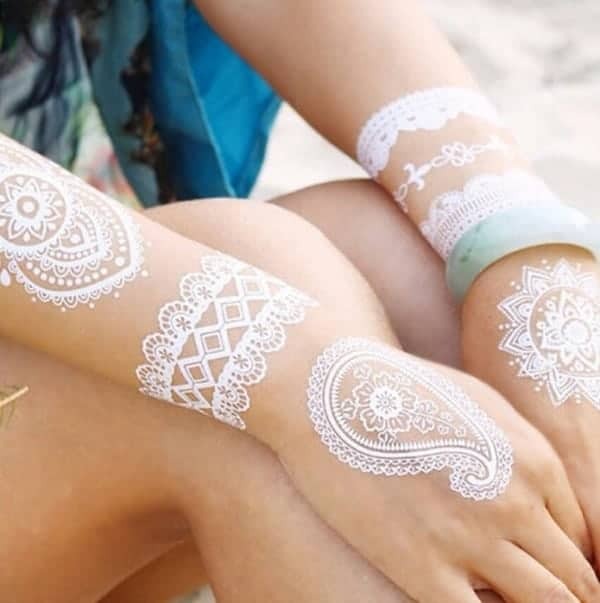 When it comes to white ink, these designs are really popular because the bright white really pops off the skin. 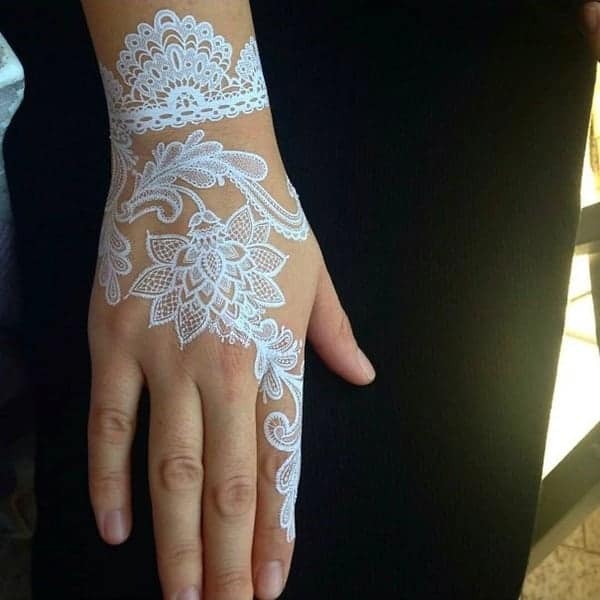 Another example of hand art that looks elegant when you use the white ink. 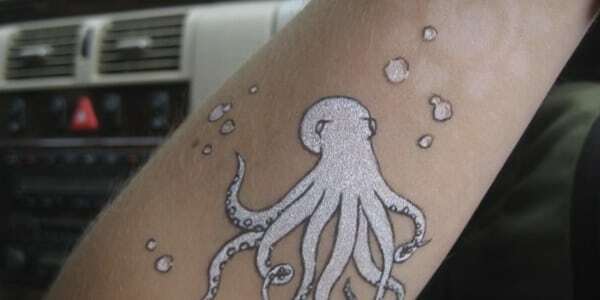 Use a white ink with a metallic tinge to it and the images will just jump off your skin. She has tattoos on her arms and both her wrists that are gorgeous. 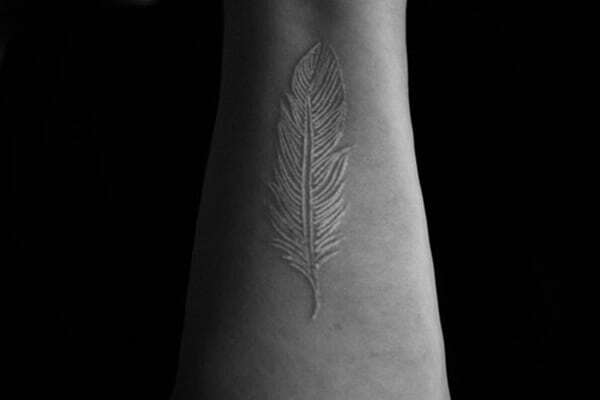 If you are looking for something delicate, you can’t go wrong with a feather. This design is truly wonderful and you will always remember it as it sits on your wrist. 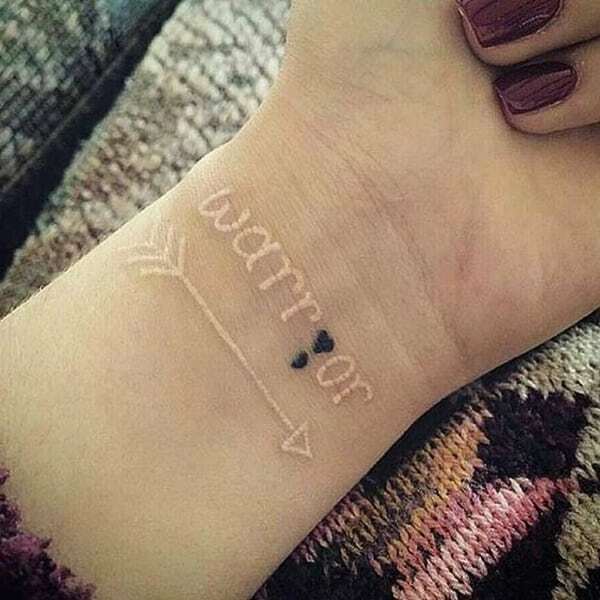 A great tattoo that is small and creative. Each image has a finger of its own and they are fun and interesting designs. A stunning design that is sweet and elegant. It’s small, so you don’t need to worry about a big commitment. 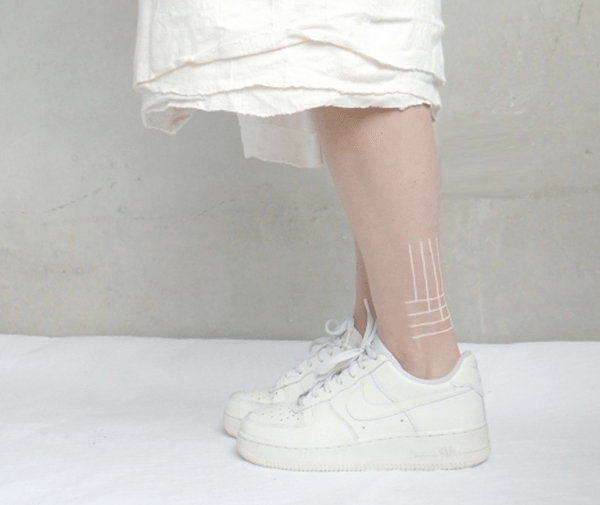 This tattoo design is so light that it’s barely even there. If you don’t want the commitment that comes with black ink, then give white a try. It’s a subtle design that you will barely notice. This person has added some gems to the style to give it a little bling. 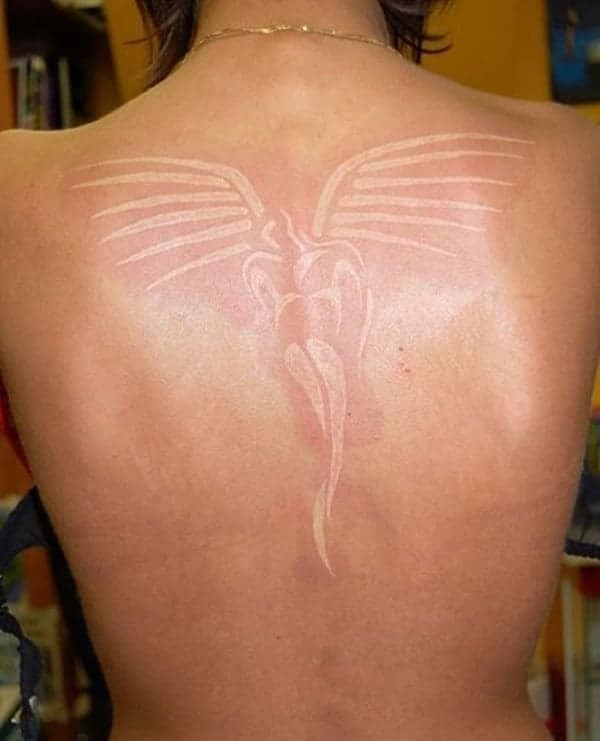 There is nothing more awesome than an angel tattoo and this one is really unique. I love the unique but simple design of this angel. 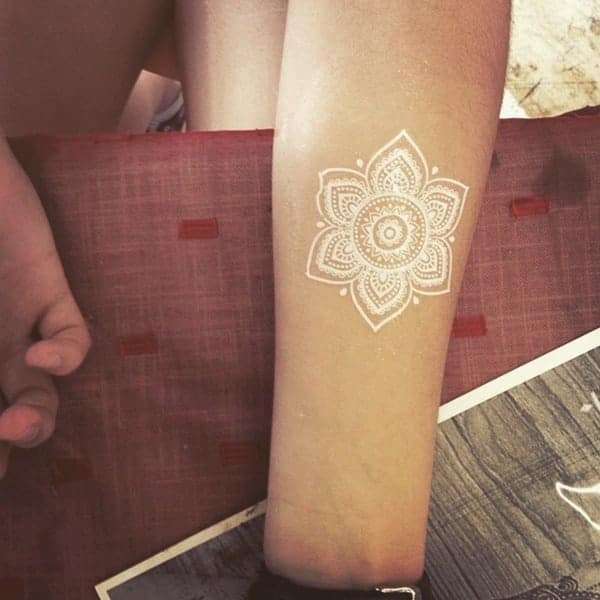 A great design that you are sure to love if you are looking for a sleeve tattoo. This white ink is barely there and yet it creates a detailed piece of art. A great design filled with many different flowers. 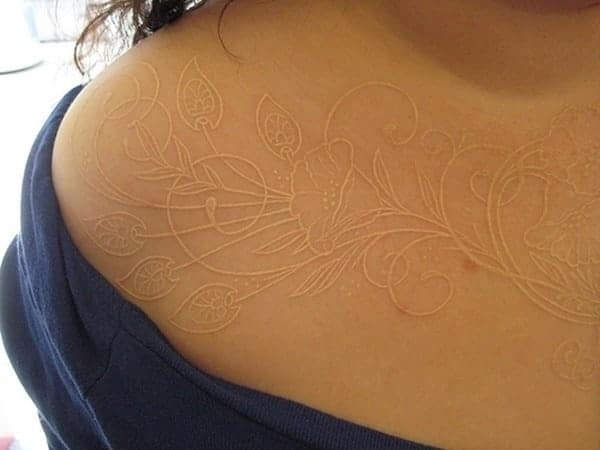 This tattoo is beautiful when using the white ink. If you are a fan of earth symbols, then you are going to love this design. It’s cute and yet very simple. 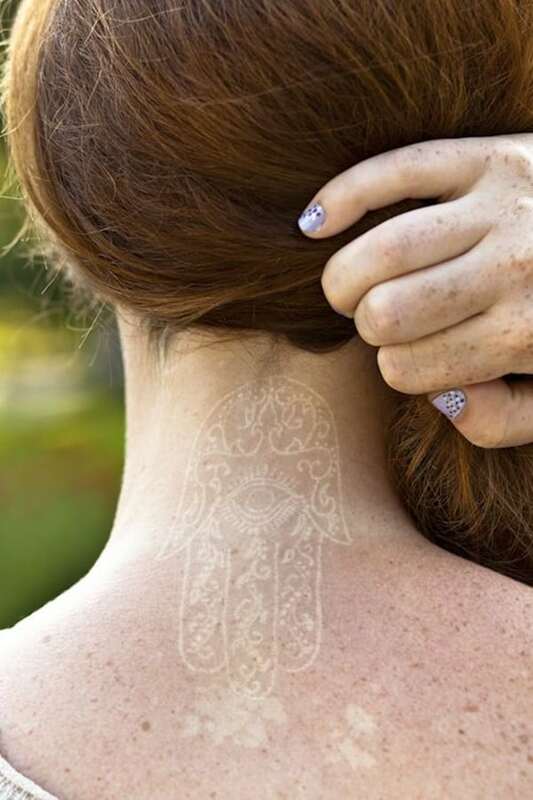 A simple white ink tattoo that looks striking on her shoulder. It’s a simple design but a beautiful one. Send the message out that you believe that all things are possible. 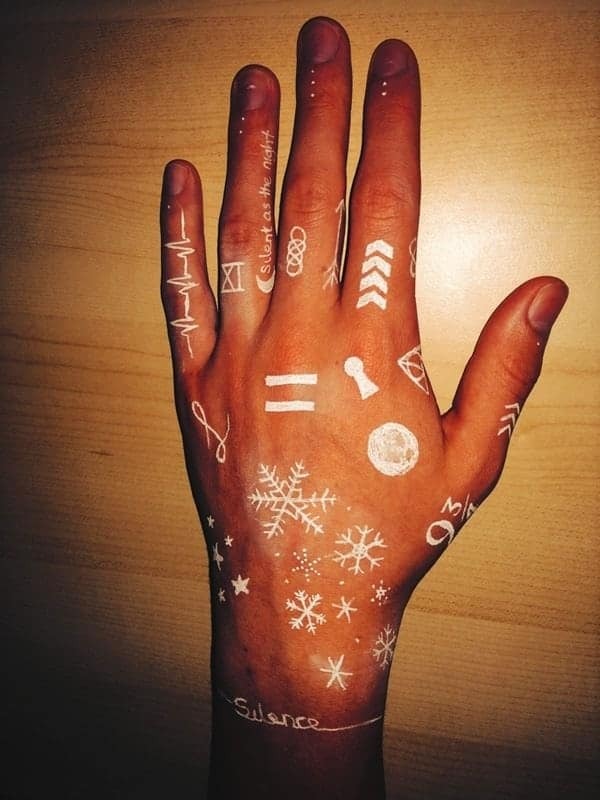 A great design for the hand because of all the great detail. A small design that fits perfectly on the wrist. 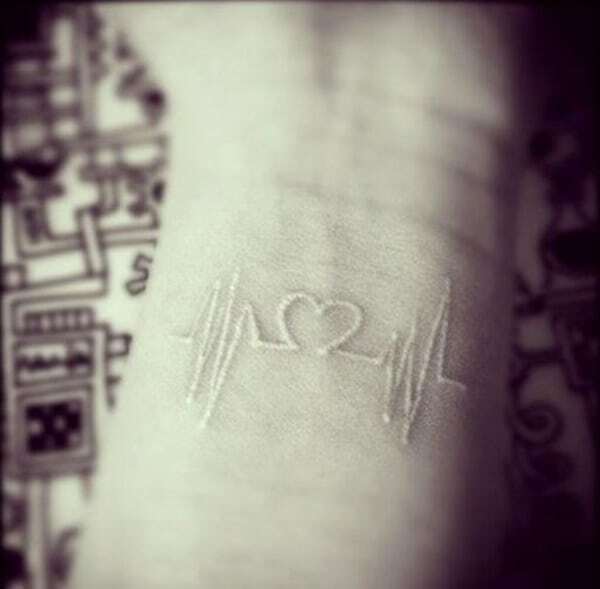 It’s a simple tattoo that will make anyone happy. 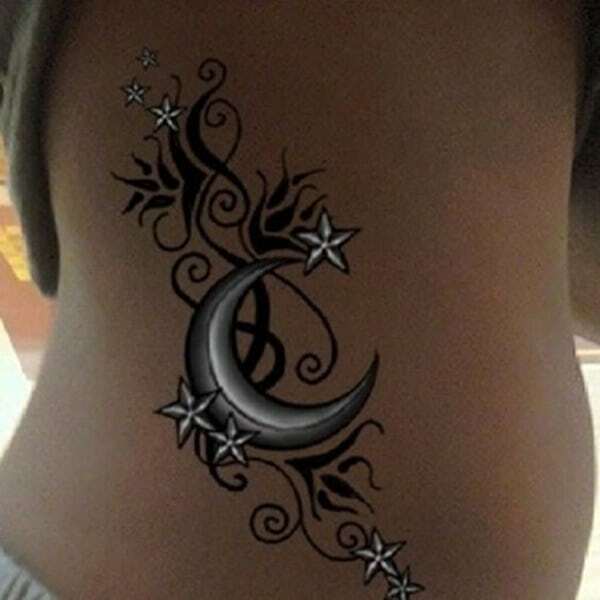 A great tattoo design that you can share with your friends. Create a design that you can get matching tattoos with your loved ones. I love how bright the white ink is on these tattoos. 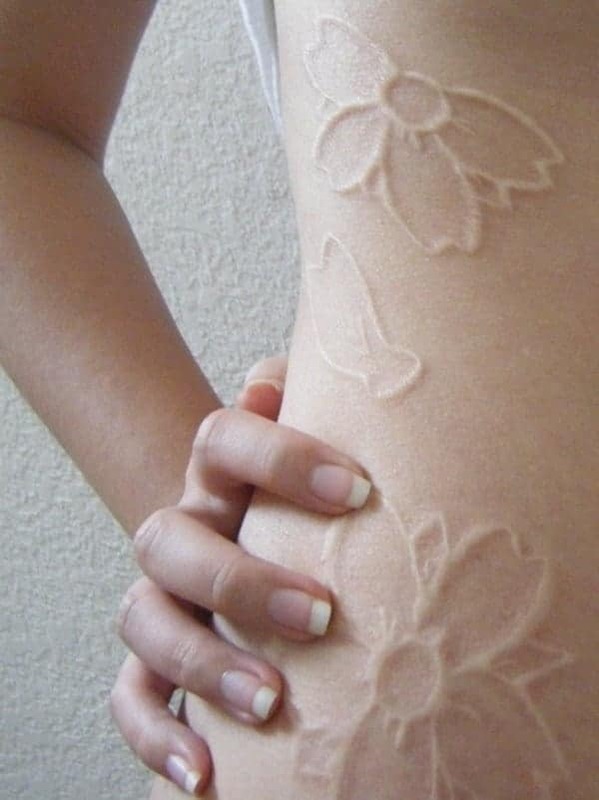 A great tattoo that looks more like an embossed tattoo than anything else. It’s a rather large tattoo that covers a large area. A great flower design that is colorful and elegant. The white petals are luminescent in this image. 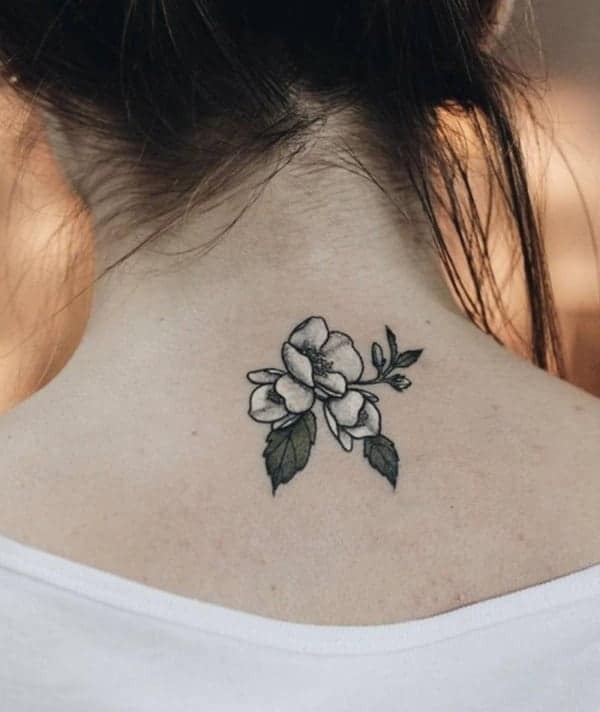 A black and white flower that is striking on the back of the neck. The white just glows because the contrast is amazing with the black and white together. These fingers have some beautiful and intricate designs on them. 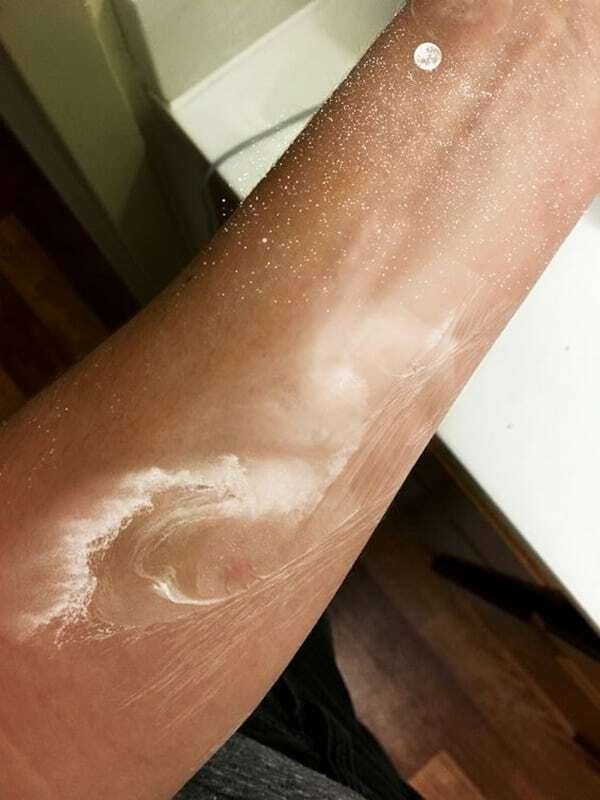 It matches the design that is on the arm as well. A beautiful design that will look great anywhere that you go. A great tattoo design on the face that’s quite pretty. Be careful with the face, it is permanent and you may not want something that visible especially if you have a career. A small circular flower design is really a special one if you love flowers. It’s pretty and small, a simple design that fits comfortably on the wrist. A delicate design that covers the wrist as well as trails onto the pointer finger. A great design with a lot of details involved. The brightness of the white ink is incredible because it just jumps right off the skin. 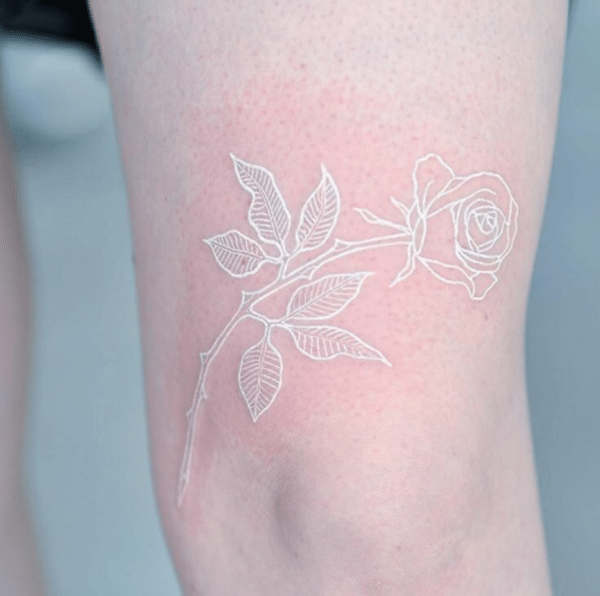 White ink is truly beautiful. 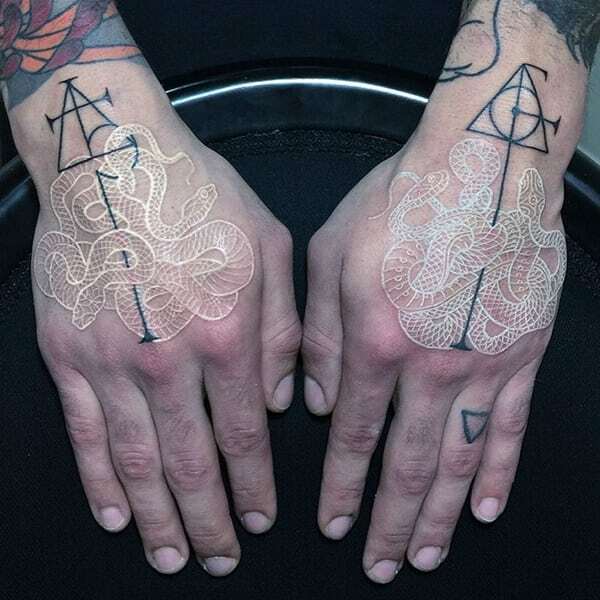 These great tattoo designs fit nicely on the fingers. 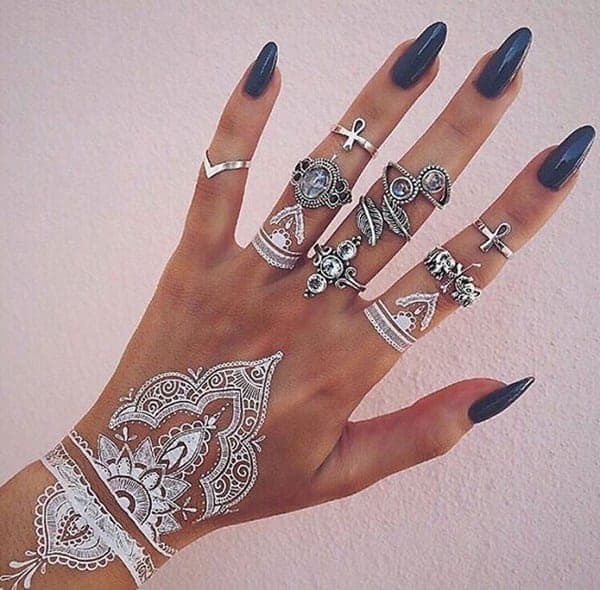 The finger tattoos match the wrist design and it makes for an amazing style if you want something different. 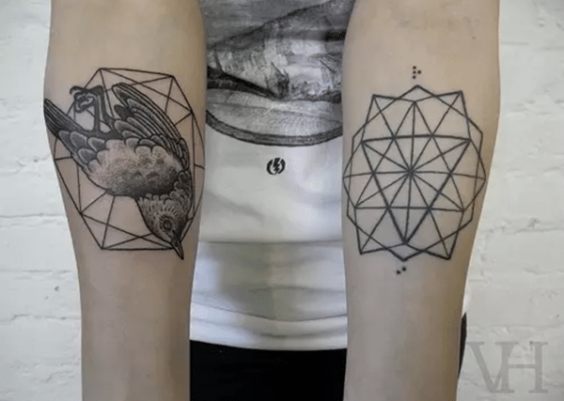 All these tattoo designs go well together and they all match up. A detailed tattoo design that really looks wonderful together. 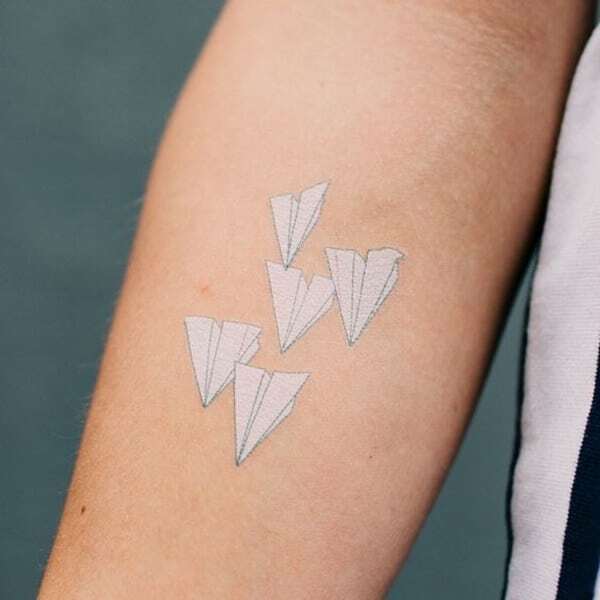 These bright tattoos are sure to draw the eye wherever you go. 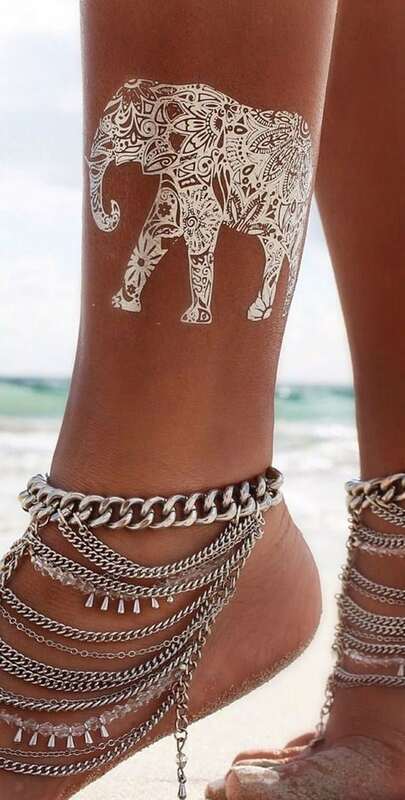 These tattoos look like they are intricate sandals painted on the feet. A great detailed art that is beautiful on the feet. I love the white and gold ink together it looks royal. These are all gorgeous tattoos, with beautiful designs on the hand that matches the tattoo design on the back. It’s a great design on the back because it’s a solid size of tattoo. I love the jewelry piece underneath the tattoo and it’s quite gorgeous. An interesting tattoo design that looks quite bright. It’s practically glowing right off the chest. A skinny design that trails down the arm as well as the wrist. The flowers are gorgeous with the pink and white together. These tattoos look like they are painted right on the arm. The tattoo goes right down to the finger; it’s gorgeous. There are so many different elements to this tattoo design. A great design where each element must mean something to the owner. It’s truly a unique tattoo idea that will cause mystery wherever you go. What a gorgeous tattoo with so many beautiful details. A thin line of flowers that went down the wrist and leads down the finger. There are a few flowers on each of the fingers that match the larger design and I love how it all goes well together. A small tattoo design that looks like art. What a beautiful design that has floral elements all through it. The bold white is truly wonderful. 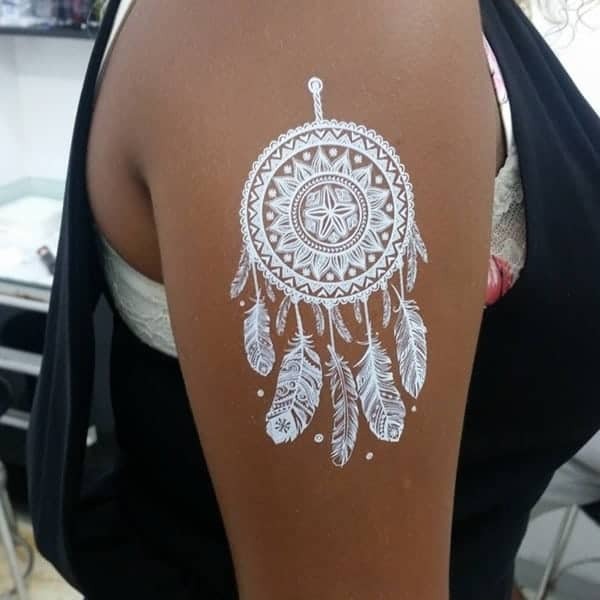 This stunning design has a detailed dreamcatcher with gorgeous feathers surrounding it. 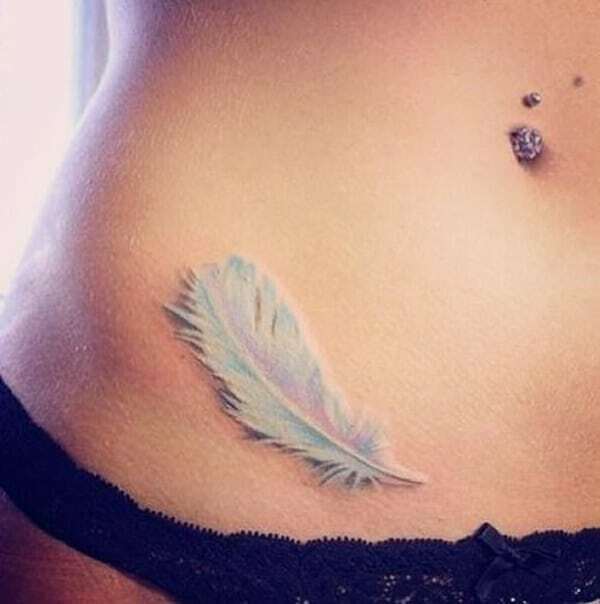 The feathers look perfect in this design. Just a simple flower but the detail is amazing. A gorgeous and wispy floral design that you are sure to love.